Last episode, a ghost appeared on the bridge of Hector Ruiz's spacecraft, the Libracampista. We also found out Alibi Jones' responsibility for blowing up Kismet had been newly made public, which can't be good. Find out how, and why the accident is now being used against Alibi Jones, and what Hector and his crew do next, on this new episode of Glow-in-the-Dark Radio, with host, writer and reader Mike Luoma. Listen to Chapter Three of the brand-new science fiction adventure Alibi Jones and the Hornet's Nest – you'll only find the new podcast novel here! 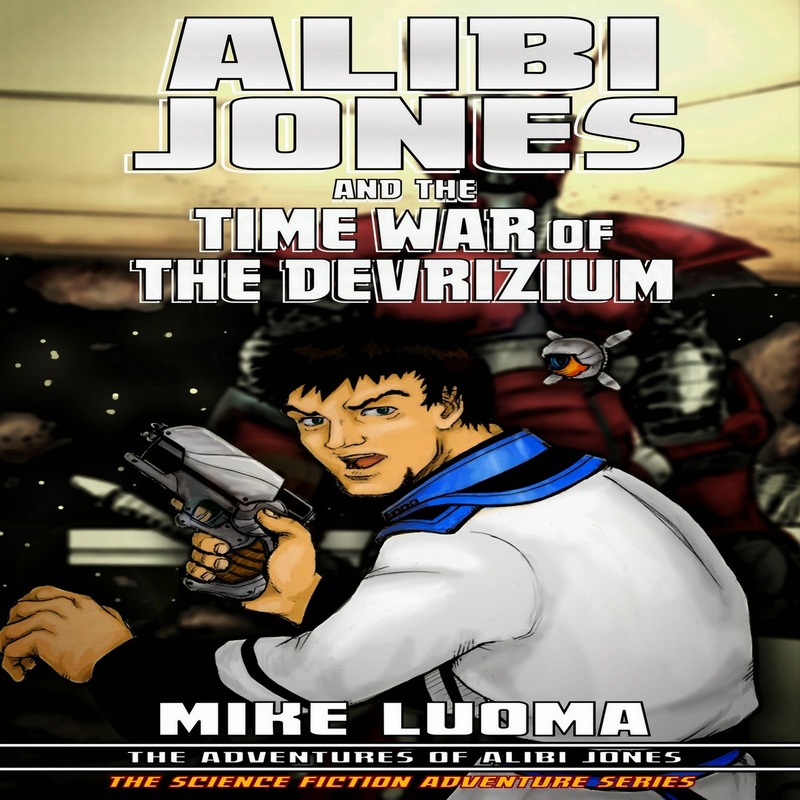 Alibi Jones and the Time War of The Devrizium Now At Podiobooks! New this week! For the first time since they were aired on Mike Luoma's Glow-in-the-Dark Radio Podcast, the stories in "The Time War of the Devrizium" are together, offered for free download at Podiobooks.com! "About Time" - "Remember Two Things" - "Memory, Yet Green" - and "The Last Battle" tell the story of time-travelling aliens The Devrizium and their attempts to wipe out Alibi Jones. Somehow Alibi's very existence in the current time-stream is a threat to The Devrizium's own continued corporeality. It begins in "About Time" with a stolen Devrizium time-travel device. That first appeared in The Adventures of Alibi Jones: Six Short Stories, repeated here to include it with the rest of the Devrizium tales. The illustrated "About Time" can be found in The Adventures of Alibi Jones #1 - the comic book - with art by Meisha. At comiXology, DriveThruComics, and Indy Planet. "About Time" - Alibi runs into an old... friend? She's brought a mysterious package with her and a whole lot of trouble on her trail! "Remember Two Things" - The appearance of The Devrizium in "About Time" was just the beginning. The only problem is that now, Alibi remembers that incident happening two different ways! Time itself may be broken. "Memory, Yet Green" - Alibi Jones is a 91 year old man waking up next to his wife as the blue sun rises on Rigel 4. Only problem? Alibi doesn't remember growing old! "The Last Battle"- The Last Battle of the Time War! Alibi is captured and hauled before the ruling council of The Devrizium to answer for his "crimes". Get them now as free, downloadable podcasts from Podiobooks.com and on iTunes. You can also get this collection in paperback at Lulu & as an eBook at Smashwords & DriveThruFiction, or both at Amazon. The crew of the Libracampista investigates a mysterious, giant old spaceship that appeared out of nowhere. Meanwhile, Alibi Jones struggles with boredom, Krish fights for his budget, and Kit and Katie verbally spar on Dakhur. Conflict is in the air! Catch up with our characters as we get into more of the brand-new science fiction adventure Alibi Jones and the Hornet's Nest – our exclusive presentation of the podcast novel continues! Hear Chapter Two on this episode of Glow-in-the-Dark Radio, with host, writer and reader Mike Luoma. A Brand-New ALIBI JONES Novel Begins NOW! AN ALL-NEW ALIBI JONES ADVENTURE BEGINS NOW! A brand-new installment in The Adventures of Alibi Jones starts on this show - a first-draft run through of Alibi Jones and the Hornet's Nest. Free science fiction audio adventure in a classic vein, narrated by writer Mike Luoma – exclusively here on Glow-in-the-Dark Radio! Alibi Jones rescued friends from Kismet, accidentally blowing up and destroying the place in the process. Fought a Time War against the Devrizium everyone strangely forgets. Now he's been sidelined, and the inactivity has him bored. Never good. What's next for Alibi Jones? Meanwhile, out beyond the border of the Solar Alliance an ancient, giant, derelict ship has materialized. What is it doing in human space? Listen and find out as we begin the adventure! End of Summer - The Big Finish! Hear the conclusion of Vatican Assassin - Chapter Thirty-One - on a brand-new episode of Glow-in-the-Dark Radio! And get a preview of the next book in the Trilogy, Vatican Ambassador! The UTZ Battle Cruiser Eisenhower drops BC - the Vatican Assassin - off on the Moon. What's left of Lunar Prime after the attacks? Find out along with BC! Science fiction audio adventure narrated by writer Mike Luoma. Get a little story set up, hear the latest news - including some important format news - and then the end of Vatican Assassin! Be sure to listen to our next episode as Mike presents a brand new installment in The Adventures of Alibi Jones - we get into a first-draft run through of Alibi Jones and the Hornet's Nest! BIG ANNOUNCEMENT! Listen and find out what's going on... And hear Chapter Thirty – the penultimate chapter - of Vatican Assassin on a brand-new episode of Glow-in-the-Dark Radio! Science fiction audio adventure narrated by writer Mike Luoma. BC - the Vatican Assassin – escaped Fortune Station on the UTZ Battle Cruiser Eisenhower when the UIN attacked. They're heading to the Moon to reinforce the UTZ forces under fire there, with BC along for the very dangerous ride... Come along, won't you? Get the story-so-far, the BIG ANNOUNCEMENT with some other cool news, then Chapter Thirty of Vatican Assassin!